At the beginning of WWI two-seater airplanes were built in accordance with the "orthodox" layout, in which the pilot had a position in the rear seat, and a gunner-observer sat in the front. Only after the appearance of the famous Sopwith 1½ Strutter did the situation change, and the two-seater airplane gained its "classic" arrangement the crew changed places in the cockpit of the airplane. It was an era in which the classic single-seat fighter had not yet taken center stage, and that is why the majority of new designs consisted of two-seaters. In 1916 British aircraft designer Geoffrey de Havilland developed one such type in accordance with the "classic" layout. It was a two-seater biplane which history came to know by its official name, the D.H.4. At first, it was planned as a multipurpose airplane with the 230 h.p. Beardmore B.H.P. engine, however in the process of putting it into series production it transpired that the engine would have to be exchanged for another type, because the B.H.P. still needed perfecting and substantial revision. The airplane passed its tests successfully, and already the preliminary orders for it from the military were overtaken they were immediately doubled to 740 units from the previous order and that was not the end of it, because the front required plenty of machines of this type. Seeking the most worthwhile replacement for the powerplant the designers of the airplane chose the 375 h.p. Rolls Royce Eagle engine, which offered a substantial improvement in the airplane's basic flying performance, however it was not being built in sufficient quantities even for the D.H.4, let alone other types of airplane. 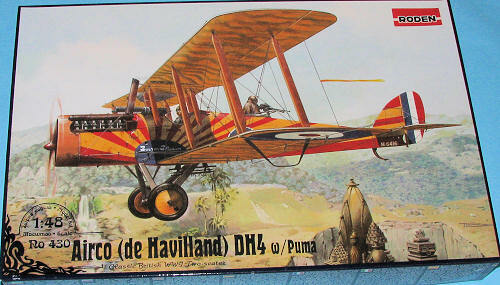 From that moment the production of the D.H.4 was expanded from the base of the main manufacturer, the Airco firm (AMC), on to the plants of several subcontractors, such as Palladium Autocars, Vulcan, Westland, Glendower and others. Taking into account the permanent problem of the availability of the main Rolls Royce Eagle engine, designers had to find a replacement for it. As a result, many machines of this type were built with installations of the RAF3a, Fiat-A12 and Siddeley Puma engines. The characteristic feature of every version was a different shape of the fuselage's nose, following the differences in the overall sizes of the engines and their exhaust systems. Airplanes fitted with the Puma engine had a somewhat prolonged nose with less of a "snub-nosed" look in comparison with the other versions, when other D.H.4s at the time were almost "straight-nosed". The D.H.4's active service career began in January 1917, and soon this type gained great renown among the pilots of the R.N.A.S. and the R.F.C.. It was capable of climbing quickly to a considerable altitude, and it could maneuver in combat with enemy airplanes. Its main task was to conduct daytime bombing missions over the territory of the enemy; however, occasionally the D.H.4 was used as a transport for secret service agents, and as a fighter and interceptor. 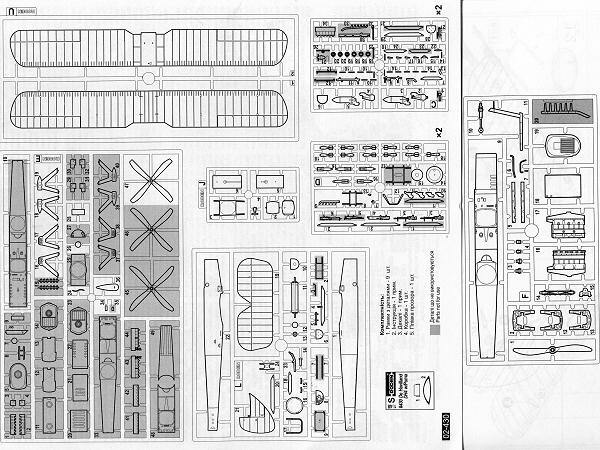 Roden has a reputation for providing modelers with good quality World War I aircraft types. They have managed to provide a lot of different sub-variants by having a goodly number of additional bits on their sprues. What this often means is that one will have a lot of parts left over and this kit is no different. Molded in their usual grey plastic, the detailing is actually quite good with only some thickish mold seams to have to deal with. The fabric detailing is quite good with properly subdued features. A complete enigine is provided that includes full braces and mounts. The inside of the fuselage sections has nicely done framework detailing. There are some ejector pin marks in this area, but should be either invisible when done or easily removed. There are nice pilot and observer/bomber positions, both having control sticks and pedals. A fuel tank sits between them. All of the wing struts are individual so some care will need to be done installing the upper wing. YOu have a choice of machine guns for the rear and this is clearly shown as to which schemes get what. The same goes for landing gear as one set of legs is a bit longer than the other. Under wing and fuselage bomb racks and bombs are also provided. When it comes to propellers, there are, again, two options depending on the camo scheme. Instructions are quite well done with Model Master and generic paint references. All planes have WWI green upper wing and tail plane surfaces but here is where the similarities in markings ends. The box art plane has a gaudy sunburst scheme on the fuselage sides and top in red and yellow . The undersides of the wings and tail planes are linen with grey-green squiggles. This aircraft was assigned to 62 Squadron RNAS based on the Turkish island of Imbros in the Spring of 1918. In an equally gaudy scheme (which is apparently the same plane at a different time) has the sunburst in WWI green and white with the fin in white. 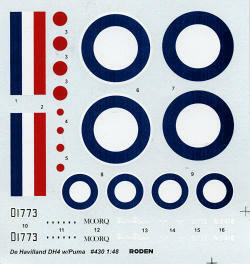 For these two schemes, Roden has provided what appear to be full size (as in 1/48) patterns. If doing these schemes, I'd copy the patterns, then cut out the required 'bursts' on tape. The final option is a 224 Squadron plane in standard colors at Mudros on the Greek island of Lemnos in the spring of 1918. The decals are very nicely done and provide all the general markings and serials needed. WWI fans will surely want to add this one to their stable of models. It is not a small plane, but it was a very important aircraft that served with disctinction.